I’m hot foiling anything and everything I can find these days and if I am being honest – you will too after you watch my video. 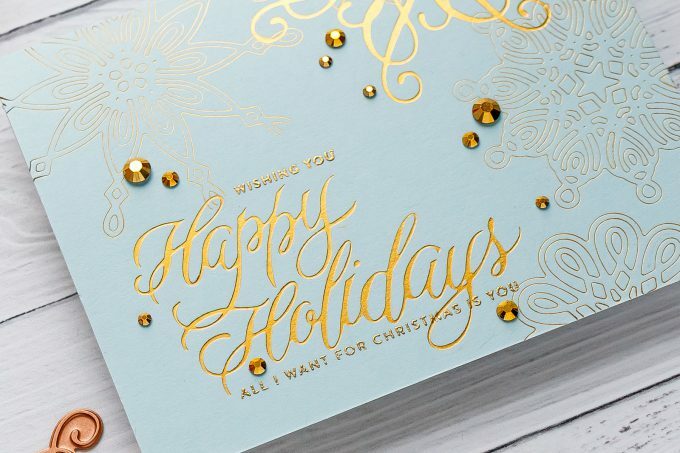 Today we are making stationery style Holiday cards using Hot Foil and Heat embossing. 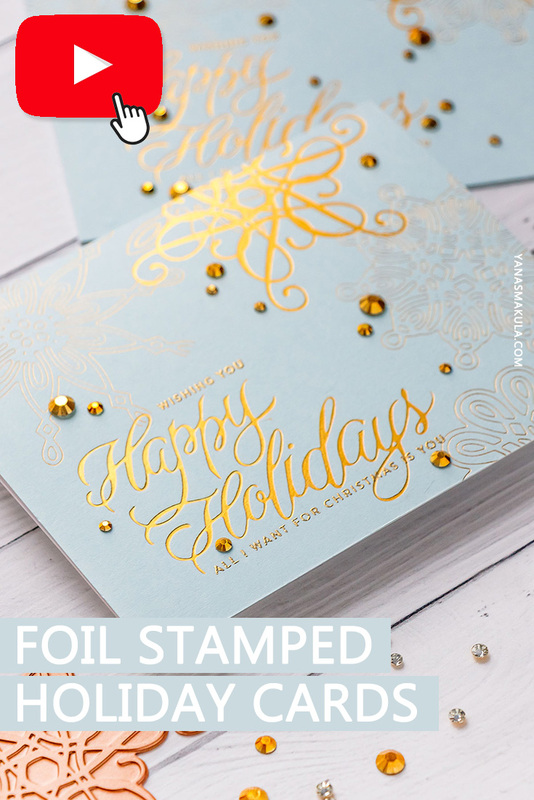 Two simple techniques you will love, because if you are like me – I know you already love heat embossing. I used both Glimmer Hot Foil plates and my regular Spellbinders etched dies to hot foil this card. 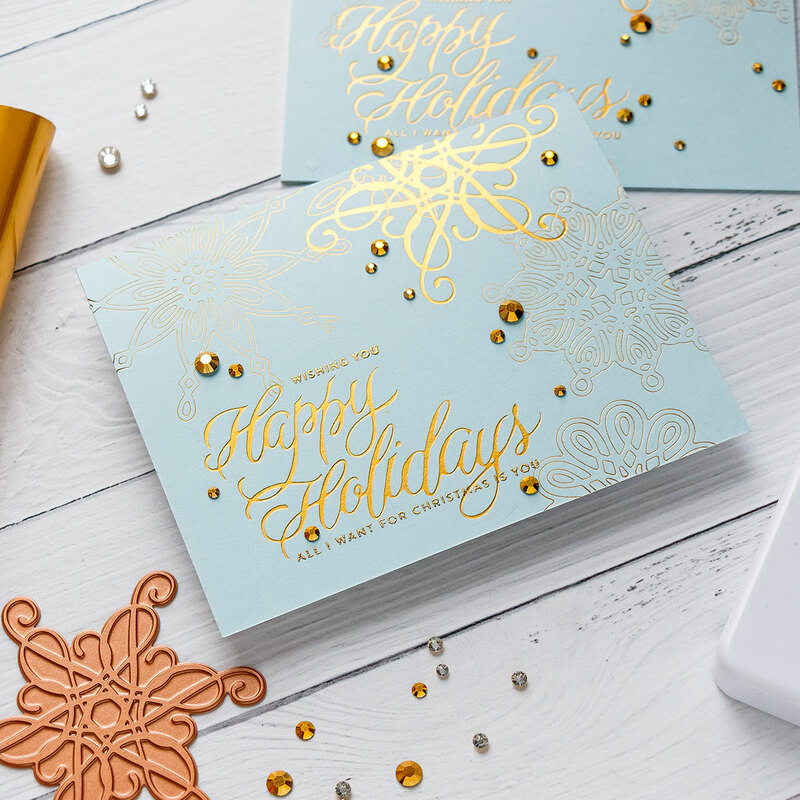 I started by foiling “Happy Holidays” and a beautiful snowflake like swirl in Matte Gold foil on Sea Glass cardstock from Simon Says Stamp. 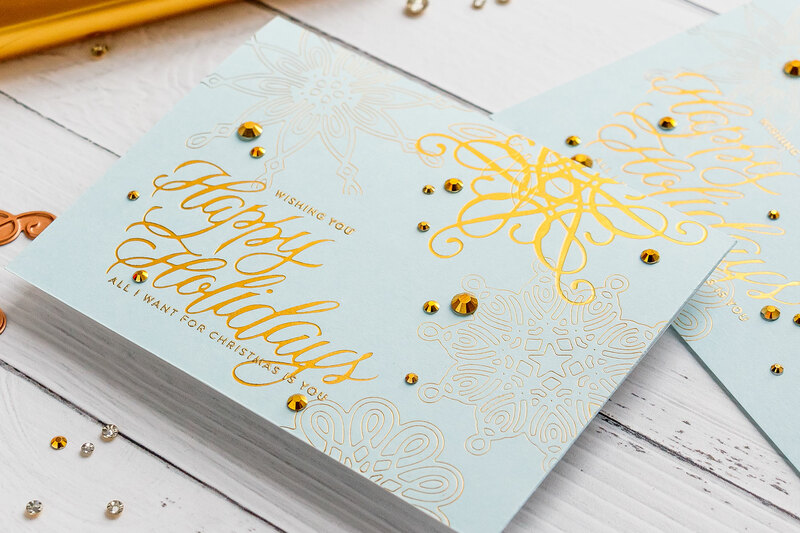 Next, I used snowflakes dies from my stash and added additional foiled effects – I love the combination of gold and light blue on this card. Next, I used stamps from my stash and gold heat embossed additional sentiments above and below “Happy Holidays”. I adhered my panel onto an A2 white top folding card base and embellished it using Gold Jewels from Pretty Pink Posh. If you arrived from the awesome Laurie Willison – you are on the right track! I’m the last stop on this hop. You can start over at the Spellbinders blog. To celebrate this release, Spellbinders is giving away a $50 gift certificate to a lucky winner. Please leave a comment on Spellbinders blog by Sunday, November 18th 11:59 pm EDT for a chance to win. The winner will be announced in the blog hop post the following Monday. Winner is responsible for shipping cost, duties and taxes. Like this card idea? Be sure to save it to one of your Pinterest boards for future reference! Love the beautiful colors. Fantastic creation! Really like your cards . Gorgeous!! Love this Gold and white combination. I’ve been able to keep myself from purchasing other foiling products but I may cave on this system from Spellbinders. It looks so easy to use and I love that it uses/stretches the products I already have. Such an innovative system! 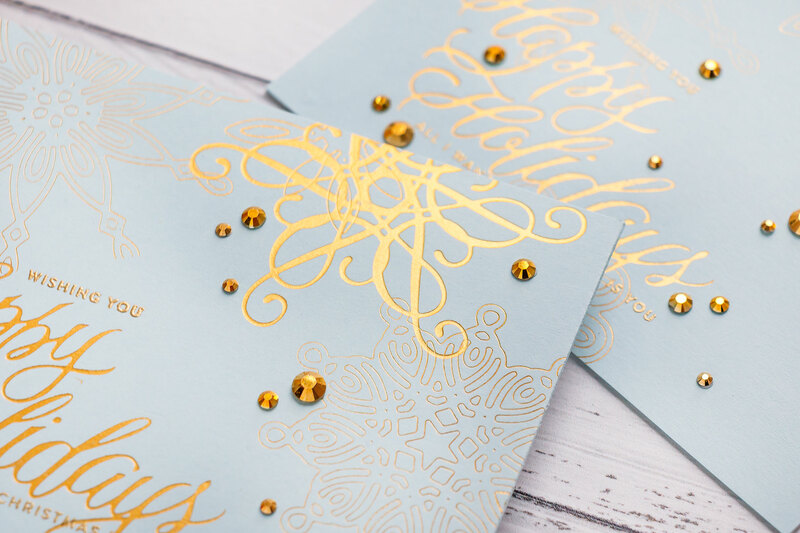 Beautiful cards, I am intrigued by this Hot foiling system! 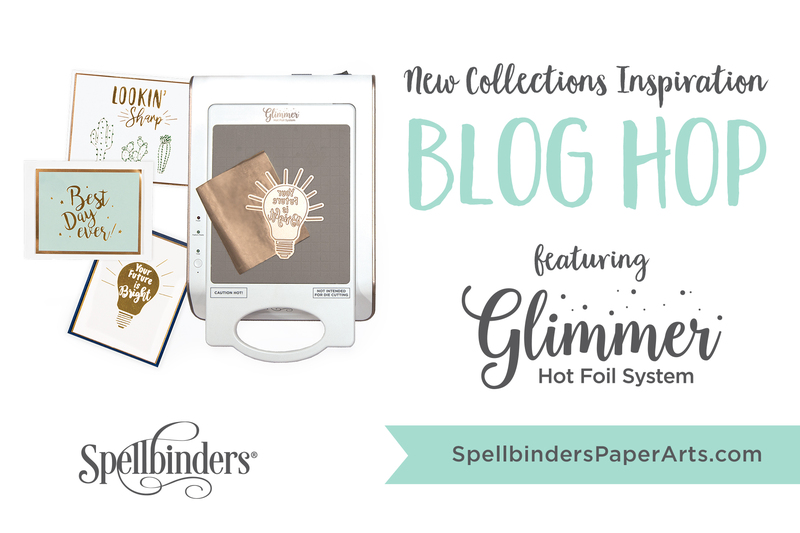 I am in love with the look of the glimmer foil plate foiling against the foiled die!!! Fab idea, thanks!! Your cards look professionally done…beautiful!!! I am so inspired to make my first project. Stunning and amazingly elegant cards! Gorgeous compositions and the gold and white is so elegant. Love what you did with the foiling! Can’t wait to try the new Glimmer foiling system! I’m a subscriber but just now coming over and saying how AWESOME these cares are!! Love those Snowflake dies especially!! Absolutely gorgeous cards! Thank you so much for sharing these! Fabulous cards! 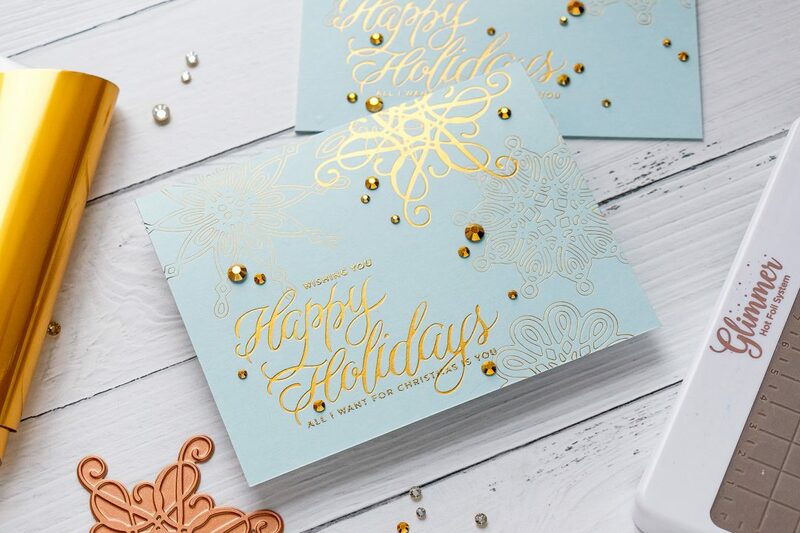 Love the snowflake designs, and so pretty in the foils! Love that sparkle! Oh my Yana, you have outdone yourself with this gorgeous card! I love that you foiled and heat embossed. This has been a fun hop and I have learned a lot about the Glimmer system. Now I can’t wait for Christmas because this is at the top of my Christmas list!